CILVER Debut New Single "Headstone"
New York rock act CILVER has debuted a third brand new song for their track "Headstone". The track is the third track of new music released from the band off their all new LP due out next month, and you can check it out below. ""Headstone" talks about the sexual inequalities between men and women in our society," says frontwoman Uliana Preotu. "A man who has one night stands or objectifies women are revered. A woman who would act similarly would confront the stigma of being called vulgar names and outcasted." "Why can't we turn the tables and look at the same issue the other way? The lyric 'there is a whore in every man I had' sums it all up. The song is exploring the very moment when she realizes that she has equal power over her choices. That realization comes loaded with a long history of feeling abused and trophied." The band has announced a new batch of tour dates around their impending release. CILVER will participate in this year's WJRR's Earthday Birthday and 98 Rockfest with the likes of 311 and BREAKING BENJAMIN. They'll also be on the road with HALESTORM and LACUNA COIL for a handful of dates in mid March. 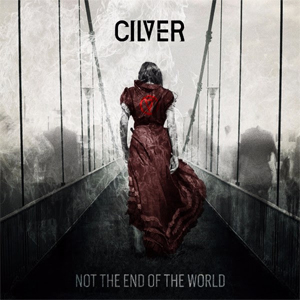 CILVER will release Not The End Of The World on April 29th, 2016 via Entertainment One (eOne), the first since signing with the indie label last year. The band's own Leon Lyazidi produced the record with help from well known producer Johnny K, who executive produced. The band is eager to release their songs to the world, the band spent a good portion of the spring locked away in Groovemaster Studios in Chicago. After landing a management deal with The RSE Group (SLAYER, GOJIRA, GHOST, MASTODON), representation from The Circle Talent Agency, and legal from Mitchell Silberberg & Knupp LLP, 2014 and 2015 ended up as the band’s busiest years yet. The band gained traction touring as openers on the Revolver Magazine Hottest Chicks In Hard Rock tour with SICK PUPPIES and LACUNA COIL. Uliana was also featured in the Hottest Chicks in Hard Rock issue of the magazine and calendar. After a series of radio festivals and showcases, CILVER found themselves on a boat with MOTORHEAD for the Motorboat Cruise this past fall. In similar fashion, the band also participated on the ShipRocked Cruise this January, which sailed from Miami to the Bahamas.